Once Tess had finished her tale, sparse as it may have been and rushed to boot, Jake turned back to scan the horizon and noted with relief that the pirates hadn’t made any visible progress on catching them up. But his face paled as he turned his attention to the other ship, the original one whose mage was after Tess. Katie and Tess both noted his pale face and tightened expression, and they turned to see what he was looking at. The tan and ivory sails of the royal mage pursuit ship stood large against the red sky. Jake pushed the throttle full ahead and prayed for the old wooden ship to hold together. Truthfully he felt that it was a losing proposition and that they were doomed before they even tried to run. The royal Mage Ship was bearing down on them with full guns run out and manned the fire-mage and the wind-mage were standing tall on the aft deck, red and white robes hanging still despite frantic weather patterns flashing all around them. The water mage that Tess had indicated was pushing the pursuing vessel was standing tall in the prow of the vessel, looking strained and about ready to collapse. Tess stepped to the stern rail and called to the winds to protect them, the very sea to rise up and shield them from their pursuers. Katie gasped as a shudder went through Halia, the old ship seeming to flex an surge ahead despite the constraining forces exerted by the water-mage only a few dozen meters behind them. With the first called order to fire, the cannons on the larger ship roared in fury, flame bleching form the short muzzles. The heavy iron balls slammed into the surf inexplicably missing the smaller ship. A ship who seemed to be shimmying and skittering around the tops of the waves, dodging the balls, however implausible that may have sounded. Jake could not understand why they were still unscathed. The fire mage leveled a blast of pure fury that took out the main sail and a good portion of the upper rigging. Katie looked up and gasped at the flames as they raced along the rigging, but the next moment the flames merely went out, the cables looking like they had never been aflame. Katie was looking manic but got herself under control when Jake looked back, catching Tess as she lurched sideways and almost falling overboard. A short moment later however, Katie herself was sent to her knees, gasping in agony as she gripped her head. The boat stopped in an instant, gale force winds out of nowhere were hammering the bow head on, pushing against the drive of the big diesel engine, bringing the old wooden creaking and groaning to a stand-still in the water while the mage’s ship kept sliding closer. Jake, too worried about Katie’s sudden onset of pain to notice the oncoming vessel, offered up a prayer to Whomever might be listening for salvation and rescue. Tess meanwhile, had retreated below-deck, rummaging and searching for something. A crash announced some new disaster but Jake didn’t even register anything beyond an acknowledgment of the noise. Jake was stunned to silence, he’d never heard Katie utter such words before, her bubbly ‘overcome anything’ outlook had been completely submerged by this turn of events. He watched helplessly as she cowered and shivered curled into the small space by the hatch to below. As suddenly as it had begun, the gale force winds stopped. Jake lost his footing and slammed into the stern rail as the engines suddenly found purchase again and Halia surged forward. The grapples from the mage’s ship few through the air, hooking securely to Halia’s rails as Jake and Katie got unsteadily to their feet. By the time the couple understood that they were well and truly caught the two ships had been pulled side to side and tied rail to rail for security and stability. Jake peripherally noted that Katie seemed much recovered from her sudden headache, the tears were still fresh in her eyes, but her face was set with the look of determination that Jake recognized meant trouble for anybody who crossed her path. At this point, the wind-mage who had brought Halia to heel, stepped closer and whispered something to his superior. The fire-mage’s eyes widened, he leaned back and looked wider at the ship Halia, then studied the two of them even closer. Jake in his blue jeans and Katie in her sweats, both with modern rain-gear on, and both looking totally out of place in a world of organic natural materials, cloaks and leather with wooden and steel framing. A few minutes of silent menace later, the firemage gestured to his lackey, who stepped to the rail and intoned, “By the divine power of the Church, you and your vessel will be held until further notice, pending investigation of your origins and intentions.” He stepped back, and a pair of burly enforcers made to clamber over the rail. The ships crested a swell in the ocean, the rails momentarily separating, and as though it were intentional,; Halia seemed to hold back jsut a fraction of a second, long enough to cause the guardsmen to misstep and fall between the ships. A fraction of a second, no more, then the two heavy boats slammed back together, crushing the two guardsmen to pulp between the wooden hulls. Katie and Jake both blanched at the screams cut short, teh cracking and crunching sound of bones as they snapped and fell to the water below. Streaming out from behind the connected ships, the only evidence of the mishap was a froth of red foam gliding silently away on the surface of the water. Jake and Katie were herded down into their ship, and the guardsmen made to follow, only to re-emerge screaming in pain and streaming blood from the multiple cuts on their faces. Jake slammed the hatch shut, locking it tight form the inside, hoping to buy some time to figure out how to escape the clutches of the first ship before the pirates arrived and made everything much much worse. As Jake, and then Katie slid down through the hatch, they were surprised at the relative mess they found in the main cabin. Fastidious was not the norm in their world, let alone their ship, but everything in it’s place was a thing for a reason. Right now however, everything was all over the place. They didn’t have long to take all this in however, with the two guardsmen pushing them from behind. Just as Jake got to the far end of the cabin, and the second guardsman set foot flat on the floor at the bottom of the ladder, a demon spirit took flight and encircled the two guard’s heads. The screams that erupted from the guardsmen were fodder for the stuff of nightmares, and the practically flew up the ladder and out the hatch. As they did so, Shanel deftly slipped sideways into a convenient nook, allowing Jake to close and lock the hatch. Thus buying them some time and preventing the guardsmen from doing anything more for the moment. Jake turned around to see that Katie was safe and feeling better for the moment, and he noticed that the front V-berth had been closed but was open a miniscule crack, with one eyeball peeking out. Tess was going to continue but the sound of boots thudding around on the deck above their heads increased dramatically. The sheer volume of the footfalls made speaking let alone hearing almost impossible. Orders were being shouted back and forth, loud enough from one ship to the other that the three captives could almost make out what was being said. Apparently whatever was happening meant that the mages on the other ship were having more pressing issues that a cast-away girl and two foreigners in an old wooden boat. The simple matter was that these three were trapped, despite their captors being distracted, how could the possibly hope to escape, at sea, with no clue which way to go, or how to get far enough away fast enough to make a difference. Tess sat rocking on the bunk in the V-berth at the bow, while Katie and Jake finally settled into the settee around the table, gripping each other’s hands, wondering just what the hell they’d gotten themselves into. Katie winced every so often with twinges of the headache that had assaulted her earlier, while Jake merely sat, feeling powerless and getting angrier and angrier as each moment passed. Finally the boots and orders seemed to ebb and quiet ever so slightly. In truth it was hard to tell, but suddenly out of the blue, Katie went rigid, as did Jake this time, he FELT her headache hit her, in his own head, but it wasn’t debilitating like it was to Katie, she was sobbing on the table. Jake felt the headache pass through him, and a warmth settled in to his chest, pulsing, he could feel his heartbeat drive the heat out to his extremities, it was surreal. Katie had pulled her hands away, curling her arms over her head, while at the same time, Tess’ head snapped up in concern for her benefactors. She stepped to Katie’s side and hovered her hands over Katie’s head, then did the same with Jake. “Know what?” Katie managed to squeak out through her pain, face still pressed cheek down to the cool table. Jake, bemused, tried to do as Tess commanded, but all he could feel was the heat in his own core. 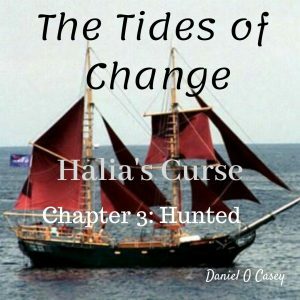 Suddenly Halia lurched and shifted, the shouting and screaming intensified out on deck. Something slammed into the bulkhead above them, and another hit the locked hatch at the rear of the cabin. As the three flinched from the impacts, something managed to shatter the glass in a forward starboard porthole, the end of the chain hanging limply where it stopped after spraying the interior with shards of glass. As Katie made a move to go push the chain back out, Tess tried to stop her. It was too late, with one hand bracing herself Katie reached for the chain, only to have an arm slam through the broken porthole, blood streaming down and dripping from the inert and apparently dead hand at the end of the arm. She screamed in shock and stumbled back, landing on bench on the other side of the cabin, stunned and on the edge of passing out. Jake could feel his anger start to flare up, he began to quiver and his hands began to twitch with the need to do something, anything, just to have that control back again. As quickly as the sounds of fighting had started, they stopped again. A polite and comparatively gentle knock on the locked hatch made Tess and Jake jump in surprise. Katie wasn’t registering anything at all again. Jake indicated that Tess should stay and take care of Katie as best she could, while he proceeded to try to consciously calm down and unlocked the hatch leading to the main deck. As the sunlight streamed in, he saw standing back respectfully, a single heavily bearded swarthy man in a cream coloured blouse, tighter fitting canvas vest with numerous pockets, and brightly coloured breeches tucked into sturdy no — nonsense leather boots. Jake shrugged, and thinking this was all a bad dream from spoiled food, he went up to talk to the pirate captain.